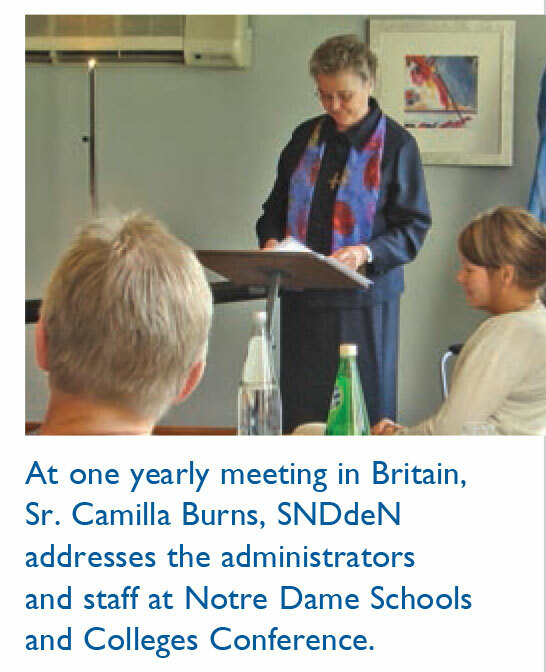 In different ways from former years, Notre Dame Schools and Colleges in Britain bring St. Julie Billiart into 21st Century Education! Founded by the Sisters of Notre Dame de Namur, these schools, colleges and the university share Julie’s educational vision. Formerly, many Sister administrators, teachers and staff integrated her educational ideals and principles in these institutions. 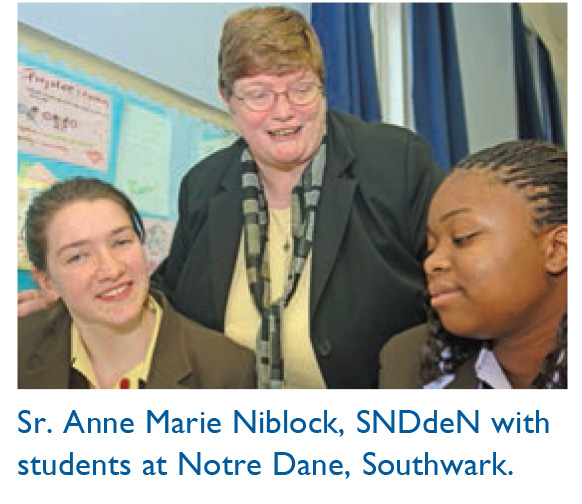 Now only one school, Notre Dame Southwark in London, has a Sister as headteacher. Yet, with strong networks, these academic institutions continue the Notre Dame Educational Mission in Britain. For over ten years, headteachers and staff from Notre Dame secondary schools, colleges and from Liverpool Hope University have participated each year in educational gatherings. The yearly conference has led to educational partnerships. Some educators have extended special links with ND schools across the world to Japan, Kenya, Nigeria, Peru, South Africa and the United States (USA). This international network uses and contributes to the resources of Notre Dame Virtual School and the congregational educational Website, Notre Dame Online. Within Britain, a Global Citizenship Conference takes place every year either in Liverpool or London for students, aged 13/14. Some high achieving students, 15/16 year olds, have shared opportunities in joint revision courses at Oxford University. Students across the schools have linked with one another in a variety of ways: leadership conferences, student exchanges, visits to other Notre Dame schools, e-mails and Social Media links on Twitter and Facebook. The schools and colleges have also developed excellent curriculum links, a photo competition and communications with postcards for a 7th year. Meetings for teachers of Science, Mathematics, Information Technology and Religious Education, held in different schools, have had amazing success. Participants have returned to their own schools with new ideas, resources and ways for taking Julie’s vision into today’s classrooms. Students from Kyoto, Japan visit Notre Dame High School in Norwich, England. The headteachers and senior staff are committed to partnership in the Notre Dame tradition. Future plans include the development of a Notre Dame app, a video on how each school celebrates St. Julie’s Day and a National Certificate for Volunteering. Notre Dame, Sheffield has an Environmental Learning Centre. Many Sisters from the United Kingdom (UK) and USA have given keynote lectures at our yearly conferences. Themes include Pilgrimage, Rivers of Notre Dame, Roots and Wings, Leadership, Online Education, St. Julie and Young People, A Global Perspective and Our Notre Dame Tradition. Several British schools participated in the international Network for Mission Conferences in Kentucky/Cincinnati and Boston, USA. Such conferences inspire administrators and faculty to a stronger commitment to education and collaboration with other Notre Dame educational ministries. One quotation lingers from the 2006 Network for Mission Conference and encourages Notre Dame educators when the times are difficult. “Suppose the best work of St. Julie is yet to come.” In the schools in Britain, Julie’s vision and mission still shape young people for the future.